International investment and related disputes are on the rise. With national courts generally unavailable and difficulties resolving disputes through diplomacy, investment treaties give investors a right to seek redress and arbitrate directly with states. 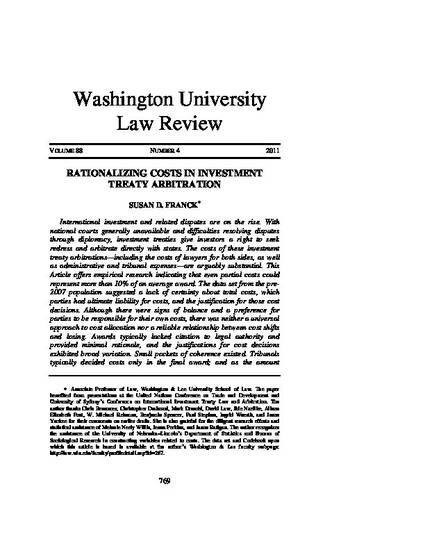 The costs of these investment treaty arbitrations—including the costs of lawyers for both sides, as well as administrative and tribunal expenses—are arguably substantial. This Article offers empirical research indicating that even partial costs could represent more than 10% of an average award. The data set from the pre-2007 population suggested a lack of certainty about total costs, which parties had ultimate liability for costs, and the justification for those cost decisions. Although there were signs of balance and a preference for parties to be responsible for their own costs, there was neither a universal approach to cost allocation nor a reliable relationship between cost shifts and losing. Awards typically lacked citation to legal authority and provided minimal rationale, and the justifications for cost decisions exhibited broad variation. Small pockets of coherence existed. Tribunals typically decided costs only in the final award; and as the amount investors claimed increased, tribunal costs also increased. Such a combination of variability and convergence can disrupt the value of arbitration for investors and states. In light of the data, but recognizing the need for additional research to replicate and expand upon the initial findings, this Article recommends states consider implementing measures that encourage arbitrators to consider specific factors when making cost decisions, obligate investors to particularize their claimed damages at an early stage, and facilitate the use of other Alternative Dispute Resolution (ADR) strategies. Establishing such procedural safeguards can aid the legitimacy of a dispute resolution mechanism with critical implications for the international political economy.